In addition to BBQ, it is possible to grill in the Q-series smokers, for that purpose we have developed a special coal tub. The coal tub must me placed to the bottom of the smoke drawer, the fat tubs must be removed. The specific shape and the perforation of the material of the coal tub guarantee a sufficient air circulation, as a result the coal stays “vivid”. The intensity of the air circulation can be regulated with the shutters that are at the ends of the chimneys and with the door of the heating compartment. It is possible to grill using grilling coal or grilling briquette. Grilling coal can be “produced” before grilling in the heating compartment by burning firewood, as a result of this the coal is generated. This is a Smoker which makes every gourmet happy, In addition to BBQ Q-series Smokers also enable to grill, we have worked out the relevant technical solution for that purpose. It is possible to grill with both grill charcoal and grill briquette. Grill charcoal can be “produced“ in the firebox before grilling, by burning wood therein, as a result of which coal incurs. What can be cooked in Q-series smokers? You just have to use your fantasy about what to cook in the smoker. Though, classical barbeque dishes are ribs, fillet pieces, shanks, whole animal and bird carcasses and fish. Barbequed fish is gaining popularity and the reason is simple: the result is a lot juicier than when smoked in a classical smoker. Flake, bream, bass, trout and salmon – all fish that taste very good when smoked are even better when barbequed! While cooking meat in a BBQ smoker is quite a long process, then cooking fish takes 20-30 minutes on average. What kind of flavour does the food have that is cooked in a BBQ smoker? A barbequed food is juicy, natural and has a smoky flavour. The intensity of the smoky flavour depends on several factors: levels of temperature and humidity in the smoker, the raw material of the cooked food, giving extra smoke, the firewood used for heating and the duration of cooking. Which restaurants and catering service providers do use our Q-series smokers? The BBQ delicacies offered in the menus of Tallink Conference & Spa Hotel, Piisonifarm , Enn Tobreluts, Toiduakadeemia, Stok Barbeque, Leib, Resto ja Aed, Peppersack are cooked in the Q-series smokers. A classical BBQ smokehouse with two chimneys. Food cooked in this gives you unforgettable taste experiences. Food prepared in BBQ method is juicy, natural, and smoke-flavored. Wood as heating material provides the best taste. Q -700 is an Smoker for a serious fan or a professional caterer, and it is easy to use and maintain. It’s developed to details, having all accessories an expert or a hobbyist finds necessary. It holds a stable temperature and humidity level that are provided by two chimneys and heat directed from the middle to the edges. The heat is regulated by ventilation through chimney valves and oven door – by closing them, inflow of air can be stopped, and the temperature can easily be controlled. 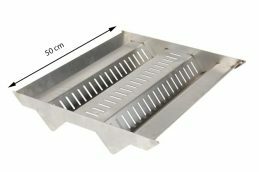 The Smoker material is a 3 mm steel that, according to our experience, is the most optimum – it provides a stable temperature and the Smoker is movable by human force (weight 90 kg). With Q-series Smoker cooks achieved first place in Grillfest, won several different BBQ championships stages, won second place in Grillstock Festival in England. In addition, cooks have participated with this oven in European BBQ Championships and achieved a considerable place in top ten. Over 300 grilling trainings have been organized with Q-series Smoker (instructor Enn Tobreluts, European BBQ champion), which proves the oven’s durability and reliability. Q-series Smokers are also used for training young chefs in vocational schools in Finland and Baltics. Q -700 can also be used as a charcoal grill. For that we have developed a special charcoal tray. For grilling, the charcoal tray must be placed on the bottom of smoke tray, first removing the drip trays. Adequate ventilation is provided due to the special shape and perforated material of the charcoal tray, thus the coal remains “alive”. It is possible to grill with both charcoal and briquette. It is possible to produce one’s own charcoal by burning wood, which results in charcoal. One may also use a combined version – charcoal in the charcoal tray provide heat and there are a few logs in the heating chamber. This results in a quick grilled dish with smoky flavor. What can be cooked in Q-series Smokers? Wood as classic heating material in BBQ always guarantees a good and natural flavor. It depends on one’s fantasy but classic BBQ dishes are rack, neck and fillet cuts, shanks, whole animal and bird carcases, and fish. Fish cooked in BBQ method is becoming more and more popular and the reason for that is simple: the result is significantly juicier than smoking in classical smoke oven. Flounder, bream, perch, trout, salmon – all Nordic fish that taste amazing when smoked, are even better when cooking in BBQ method! When cooking meat in BBQ method is quite a long-term process, then cooking fish takes approximately 20-40 minutes. BBQ Smoker (and cooking method) enables to prepare a true party hit from simple and reasonably priced ingredients (e.g. gastronomic rack, different fish). How does BBQ food taste? Food prepared in BBQ method is juicy, natural, and of smoky flavor. The intensity of the smoky flavor depends on several factors: the temperature and humidity level in the oven, raw ingredients, giving additional smokiness, wood used for heating, and cooking time.